Habitat: The plant is native to Europe and Asia. Highly adaptable, but it prefers sandy-gravelly soils. 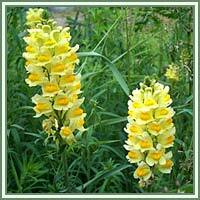 Description: Toadflax is a perennial plant. It has a creeping root system and erect, unbranched stem that can grow up to 1 meter in height. Leaves are soft and lanceolate, alternate and pale green in color. Flowers are bright yellow, closely resembling snapdragon. They are arranged alternately in dense spikes. Toadflax flowers during summer, from June to October. Useful components: Flavonoid glycosides, flavonoids, organic acids. 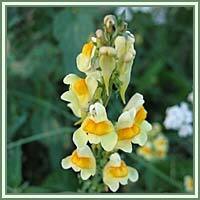 Medicinal use: Toadflax is mainly diuretic and laxative. Used internally, Toadflax was usually applied in cases of liver disorders, edema, gall bladder dysfunctions and different types of skin conditions. It also had a reputation of being a helpful remedy for dropsy. A decoction made both from leaves and flowers can be useful in treatment of different liver dysfunctions. Used externally, in form of an ointment made from the flowers, it can be helpful in cases of skin eruptions and inflammations, hemorrhoids, sores and ulcers. Common Mallow juice is a very helpful eye tonic. Safety: The plant is slightly toxic; use it with caution and with help of a professional. Some herbs could react with certain medication. Therefore it is advisable to contact your doctor/herbalist before consumption of any herb.